Seresto Flea Collar Reviews and How It Compares with Advantix For Dogs? 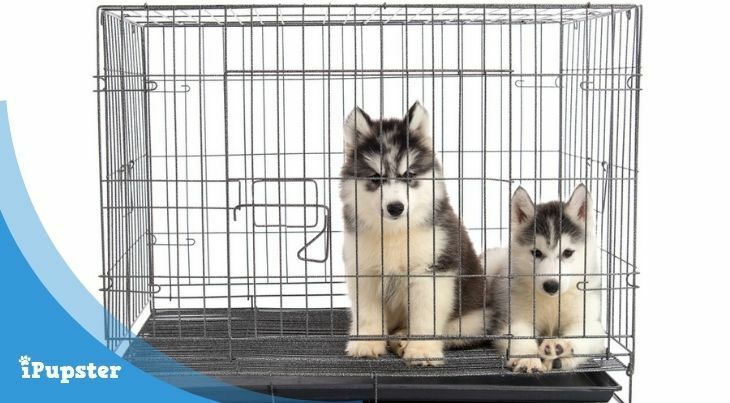 When used properly, dog crates can be a great tool for house training a puppy, a comfy den at home and while traveling. Since it requires investment, owners should take the time to learn about the different crates that are available before choosing the right one for their dog. Comes in 6 sizes, has single/double door, offers dividing panel. The plastic tray is removable and easy to clean. Folds flat so easy to store and transport. Great for aggressive chewers and large dogs. If you are looking for the best dog crate in the market – this is the gold standard of dog crates! It scores high on features, price, quality, size and aesthetics. It also helps since the manufacturers behind MidWest have been around since the 1950s constantly making slight improvements in their best sellers. Among the many crates they have, the MidWest Life Stages Folding Metal Dog Crate is a favorite brand of large crates that won't disappoint. In reviewing the quality aspect of this crate, it is without a doubt a crate build to last. I’ve owned two of these crates at different points and have always found them durable and very functional. From the materials used down to the latches holding the frame together, this metal crate will withstand vigorous shaking if your dog gets playful inside and both the metal frame and the plastic pan are incredibly sturdy if your dog is a chewer. Watch this quick video (under a minute) of how to assemble the MidWest Crate to see the quality of this crate for yourself. The crate comes in two different styles: single or double door. If you have just the one dog, the single is a better option for you. 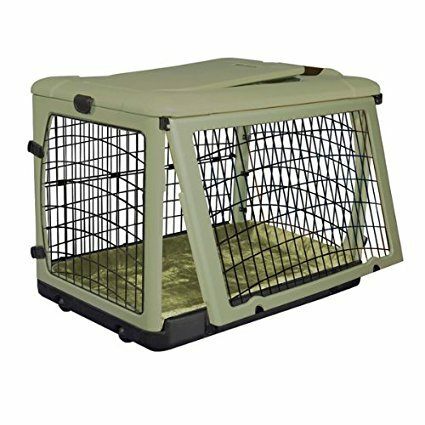 If you are looking to crate two dogs, the double door is the better crate for you. There is a dividing panel which will give the two dogs their own space or if you have a puppy you can use it and then simply remove it when he is fully grown up. The main feature we like is that the crate is easy to collapse and put back together so great for when you are travelling. The crate comes in six different sizes and here are the recommended MidWest crate size per breed weight. 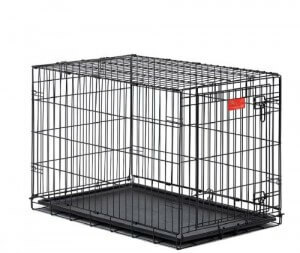 For large dog breeds over 50 lbs: the 42 or 48 inch crate is the best large dog cage. For medium dog breeds between 26 and 50 lbs: opt for the 30 or 36 inch crate. The 30 inch crate which has a height of 21 inches is best for pinschers, bigger terriers, corgis and cocker spaniels. The 36 inch crate which has a height of 25 inches is best for Dalmations, German shepherds, collies and hounds. For smaller dog breeds under 25 lbs: the 22 or 24 inch crate is the ideal crate for smaller dogs such as Jack Russel Terriers and Dachshunds. Pricewise, it is very affordable among other highly rated dog crates yet the price will vary based on the size of crate you will choose as well as whether you’ll avail of a single or double door. All in all given the wide variety of sizes and features to select from, the MidWest Life Stages offers superior quality at affordable prices built with every dog in mind and of every size. Recommended Bed For ​​This Crate. Comes in 3 sizes, single/double door and a separator. Easy to collapse and transport. Great for dogs of all sizes. Simple to set up and inexpensive. Our second recommendation is a new entrant from AmazonBasic and it’s their high-quality AmazonBasic Folding Metal Crate. Built with sturdy metal frames and well tightened latches it’s a second runner up for the best metal dog crate. Suitable for dogs of all sizes this dog kennel will withstand any dog rattling it’s latches and the plastic pan can be easily removed for cleaning. The AmazonBasics Folding Metal Crate is the best collapsible dog crate which comes in two different styles: single and double door. A separator comes with either option which serves the purpose to either decrease the crate size or separate two dogs in the same crate. Since it’s collapsible, it easier to fold down even than our first option- MidWest. Unlike the MidWest, AmazonBasics comes in three main size options but that has it’s advantages too since it’s over simplified for owners and makes the decision process that much easier. For large dog breeds over 50 lbs: the 42 inch is the best size crate for your dog. For medium dog breeds between 26 and 50 lbs: the 36 inch is the best size crate. For smaller dog breeds under 25 lbs: the 24 inch is the perfect size crate for your dog. Pricewise this is one of the cheapest quality dog crates and again it’s price will vary depending whether you opt for a single/double door and the size you select but you will still end up paying less overall in comparison to the other high-quality dog crates. All in all, the AmazonBasics Folding Metal Dog Crate is a very close contender to the MidWest offering exceptional value for money with near-matched quality. R﻿﻿﻿ecommended Bed for this Crate! Comes in 6 different sizes, single/double door and a separator. Beautiful black finish and very durable. Great for small and medium dogs. Great for crate training puppies and non-aggressive chewers. Midwest iCrate is our pick for the third best wire dog crate and is nearly identical to our first option with the main difference being that it is suitable for dogs that non-aggressive chewers. Quality-wise the frame is held together by two side bolt latches to securely hold the door in place and rubber feet on the bottom to protect floors from getting scuffed and scratched. This crate has a strong carrying handle for easy transportation and folds flat for convenient storage. This crate has both a front and side door so owners can place it whichever way fits best in their home. A removable plastic pan goes at the bottom of the crate and makes clean up a breeze. It comes in two different styles: single door which suits owners with one dog or double door for owners looking to crate two dogs. It comes in 6 different sizes which is quite surprising and it is probably amongst the best small dog crates you'll find. Here's a breakdown of the dog crate size matched per dog breed. For large dog breeds over 50 lbs: opt for the 42 or 48 inch crate. For medium dog breeds weighing between 26-50 lbs: opt for the 30-36 inch crate size. For smaller dog breeds weighing under 25 lbs: opt for the 22-24 inch crate size. Owners love this dog crate because it is affordable, sturdy, and easy to build. 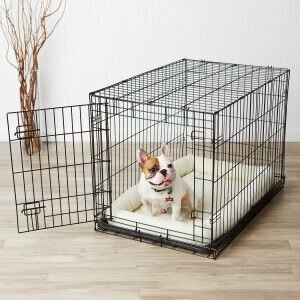 It even comes with a free metal partition so the crate’s size can be adjusted to suit a growing puppy’s needs. The Midwest iCrate is great for dogs who are new to crates or dogs that have been crated before and not aggressive chewers. Recommended Bed for this Cr​​ate! Comes in 3 different sizes, two doors, top entrance, three mesh sides. For medium to large dogs not prone to chewing. Lightweight but sturdy, easy to fold and transport. Flaps roll up for use as a bed. The Travel Pet Home by Petsfit is our pick for the fourth best dog crate. 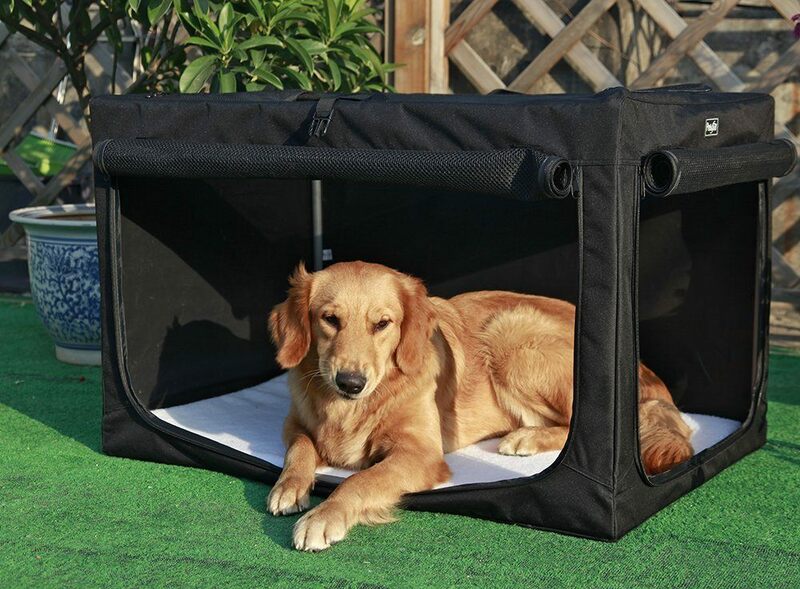 This pet crate makes a great dog bed at home, while travelling or on camping trips. This soft crate also scored well in quality, price, features and size. Best for medium to large dogs who are already crate trained, this version has two sturdy zippered side doors as well as a top entrance with Velcro to keep the doors open if desired. The patented metal frame locking system is so simple that it only takes seconds to set up and take down, with no tools necessary. It is lightweight and portable. Mesh siding keeps the crate well ventilated. The fabric covering the frame is highly durable and won’t rip if you were to a have a puppy clawing at it or catch it on a corner. Soft fleece padding at the bottom is comfortable for dogs to lay on and can be removed for convenient cleaning. Tip: Use Nature's Miracle to get rid of any unwanted stains. The Travel Pet Home Indoor/Outdoor Portable Pet Home comes in three different sizes: 24 inches, 36 inches and 42 inches. Here are some guidelines for which dog crate size best suits which breed. The 36 inch crate is suitable for German Shepherds, Labradors, Pitbulls, Bigger Terriers etc. The 42 inch crate is suitable for Male German Shepherds, Male Labradors, Mastiffs etc. Pricewise, this dog crate is only slightly more expensive than our other options but is jam-packed with dog-friendly features. The Travel Pet Home by Petsfit is the best pet crate with owners loving how lightweight, sturdy and cleverly designed this crate is. It is a great choice of an indoor/outdoor dog crate and we highly recommend this crate if you're travelling with your pet or use it indoors as a pet home. Recommen​​ded Bed for this Crate! Comes in 3 sizes, wheels, 4 doors, garage door, plush bed, cover. Flat packs to nothing so easy to store and transport. No tools required to set up and fold down. Attractive, deluxe, highly functional crate. The PetGear Crate with Plush Mat is our pick for the fifth best dog crate. As the most expensive of the dog crates being reviewed here, this dog crate has the most features by far and has been cleverly designed to both look great and be functional. This deluxe hybrid steel and plastic crate is striking in its appearance and comes complete with a free fleece bottom bed and a storage or carry bag. Built with blow-molded durable plastic, it also has steel inserts with rounded corners to help prevent unwanted damage to your home or your car. The first nice feature is that the crate has four doors including the large side “garage” door which slides up and down- so plenty of ventilation. When flatpacked, it folds to nothing so great to store and travel with it. It also has wheels which comes in handy when transporting it. It is a decent and large sized crate and more importantly comfortable for your dog. The bottom padding is plush and machine washable. It comes in three different sizes: 27 inch, 36 inch and 42 inch. Use the 42 inch crate for dogs over 50 lbs. Use the 36 inch crate for dogs weighing between 26-50 lbs. Use the 27 inch crate for dogs under 25 lbs. Aesthetically it looks very stylish and is more den-like than your traditional wire crate. It is one of the pricier dog crates amongst all our highly rated dog crates but quite a popular choice among dog owners. It comes packed with features, is highly functional and is available in a multitude of sizes. The price will vary based on the size that you require. We consider this to be the second best value portable dog crate on the market. To find out what size crate they need, owners simply need to measure the dog’s length from the tip of its nose to its tail and add a couple of inches. For the height, measure from the top of the head or ears (if they are perky) to the ground. Finally, measure the dog’s width and add a couple of inches to be sure that they have enough room to move around. 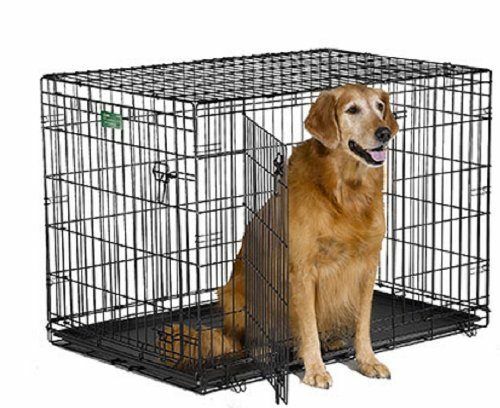 Golden Rule of choosing the right size crate: your dog should be able to stand without crouching, lie down comfortably and sit without having any part of his body touching the crate. If you are buying a crate for your puppy, take into consideration his or her fully-grown size and buy the crate your puppy will eventually grow and fit into. Large size crates are perfect for dogs under 70 lbs. Medium size dog crates are perfect for dogs between 26 and 50 lbs. Small size dog crates are perfect for dogs under 25 lbs. Which Type of Dog Crate? There is a large selection of wooden crates available that look great with owners’ home décor, fitting in with furniture better than wire or plastic crates. These stylish crates can also double as a usable surface on top, adding extra functionality. While stylish, these crates can be expensive, harder to clean, and can be damaged easily by destructive dogs. Wire crates also known as metal crates for dogs are a common choice for dog owners because they are easy to keep clean and most fold flat for easy storage and portability. Dogs like these crates because they offer good airflow and don’t restrict the dog’s view of its surroundings. Some dogs don’t like the open space though, and these crates don’t retain heat in the cold. For active dogs, these crates can be noisy and they are one of the easier types to escape from. Plastic crates are generally used for travel. The label will tell owners if a plastic crate is airline approved. These crates are lighter and easier to manoeuvre than a wire crate and they offer more shelter for dogs that are anxious when traveling. Plus, plastic crates are harder to escape from. Some disadvantages to plastic crates are that they are harder to clean and can lead to stress for dogs who aren’t used to being so closed in. Soft-sided crates are perfect for dog owners who don’t like the cage-like appearance of wire crates. These crates are soft and comfortable for dogs to lay in, like a dog bed but with sides that can be closed. Soft-sided crates are extremely lightweight, easy to set up, and can be folded away for storage. These crates are the least durable and can easily be torn apart by large or destructive dogs. They are more difficult to keep clean and dogs can learn to open the zippers and escape. Each crate option has its own unique advantages and disadvantages. Overall, wire crates are the most practical option. They are relatively inexpensive, easy to clean, and good for use at home or while travelling. For added warmth or to block out distractions, owners can easily buy a crate cover than can be removed and washed when needed. The trick to training a dog to enjoy using a dog crate is by creating positive associations with it from the start. Leaving the door open, start by placing treats in the crate when the dog is not looking for a pleasant surprise they can discover later. Next, get the dog used to going in the crate by putting their bowl at the back of the crate during meal time. Eventually, when they get more comfortable, close the door behind them while they eat. Work on rewarding the dog for going in the crate and train them to wait for your command before coming out. Just don’t leave your dog or puppy in their crate for extended periods of time or overuse it as punishment or they will come to fear and hate it. Watch this quick refresher video with Cesar on crate training. There are many different types of dog crates out there. Choosing the right one can be a challenge. Wire crates are best for owners who are training their dog to get used to a crate for the first time, because they are sturdy, affordable, and easy to clean. We hope our buying guide has been useful in helping you making an informed decision. Be sure to also check out our guide ​to crate train a puppy fast using 6 simple steps.